Imagine you had to choose, and could choose: you can spend your whole life and raise your family in either of two equally prosperous countries. In one country people work lots of hours to attain that prosperity. In the other country people work far less. You don’t know anything else about these countries. Which would you choose? The answer seems kind of obvious, right? Equally prosperous, and less work for me and my family? Sign me up! There’s one main generalized takeaway from this that I see: The less-work end of the spectrum is dominated by western European countries. People there work far less hours in the course of their lives. People in “Anglo”-model countries work far more. 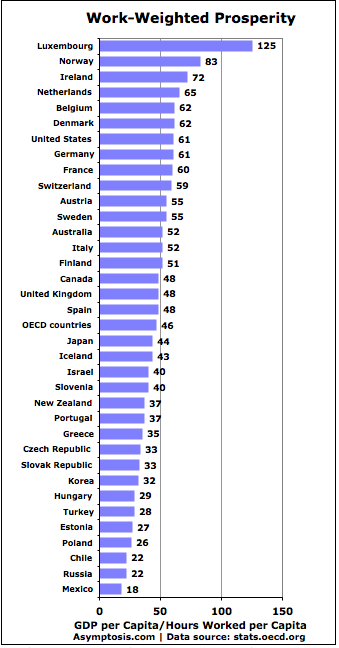 One perhaps-surprising takeaway from this graph: hard-working countries aren’t richer. QTC. Causation? It seems improbable that working less would cause higher prosperity. 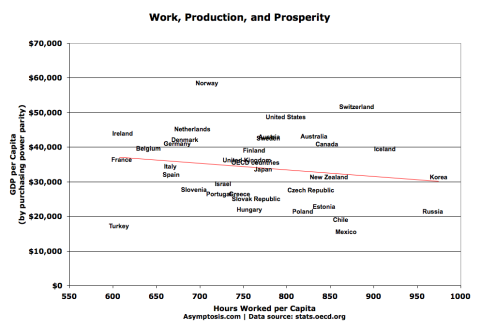 Higher prosperity could quite reasonably cause people to work less. 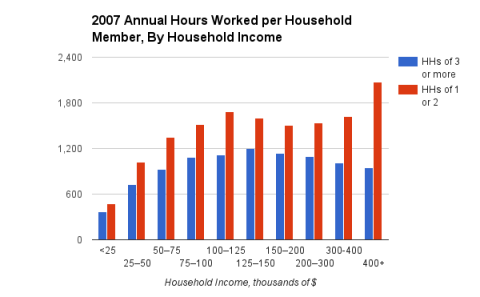 (The good old substitution effect, income versus leisure.) But the most likely conclusion is that high productivity (GDP per hour worked) is the 800-pound gorilla when it comes to prosperity. Long hours worked have zero or negative apparent effect on prosperity. Rather than eyeballing that scatter plot, you might want a handy index of which country to choose. Here’s one approach to what I’ll call Work-Weighted Prosperity: GDP/Capita divided by Hours Worked/Capita. If people in one country have to work lots of hours to get that prosperity, it gets ranked lower. The takeaway here? Move to Luxembourg and get into banking. The curious among you are probably wondering about different countries’ working-age populations (doesn’t actually vary that much), and the percentage of working age that are working (varies somewhat more). Here’s the spreadsheet. But in his dissent on yesterday’s King v. Burwell (Obamacare) decision, he chooses to ignore that statute’s obvious, objective purpose: to provide subsidies for buyers of exchange plans. This very smart man could easily “come up with a reason.” Since those words contradict the obvious, objective purpose displayed by everything else in the statute, the words were accidentally misphrased. You might even go so far as to say that this is the obvious, “objective” conclusion. You may feel free to quibble over “purpose” versus “intention,” but the obvious, objective, intentional purpose of the statue was to give subsidies to purchasers of exchange plans. Any attempt to deny or obscure that reality is pettifogging pedantry. Nothing more. The meme is ubiquitous, and widely documented: Rich people work longer hours. Obvious implication: they deserve what they get, right? Ditto the poor. Why? All the research supporting that meme looks at workers, not families. It completely ignores students, the retired, and anyone else who isn’t working. Alert the media: workers work more than non-workers. 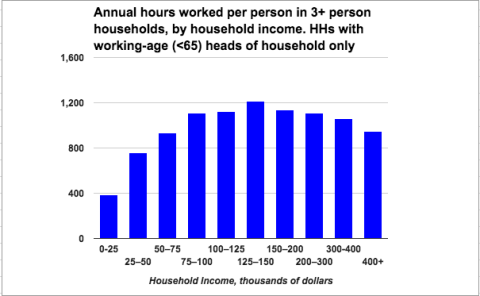 Here’s the same 3+ household data for working-age families only: those with a head of household under age 65. Pretty much the same story. This is all based on a fast-and-dirty random census pull of about 5,000 U. S. households, from IPUMS. It uses 3+ households as a proxy for families — probably not a bad proxy. A professional economist doing proper due diligence would fine-tune that, or even better turn to the Panel Study of Income Dynamics (PSID), which has better microdata to track families. Careful work would even allow them to track extended, multi-generation families, not just nuclear families living together. (Think: dynasties.) I’d expect the pattern we see here to be more pronounced in that view (though that’s just a surmise). 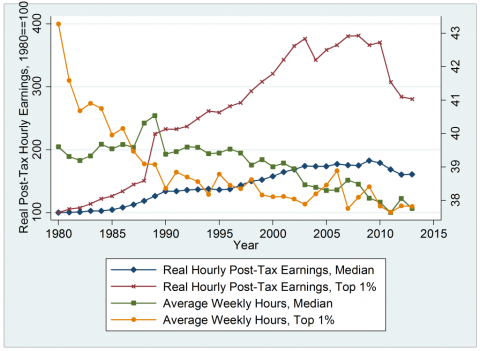 Even as rich people’s incentives to work have skyrocketed, their hours worked have plummeted. This even though they’re far more likely to be doing doing interesting, engaging work in pleasant environments. Curious. There’s a stylized fact out there, universally repeated by economists and pundits, that seems to misrepresent the state of the world. There are some nice tractable research projects here for those who are paid to do such things. 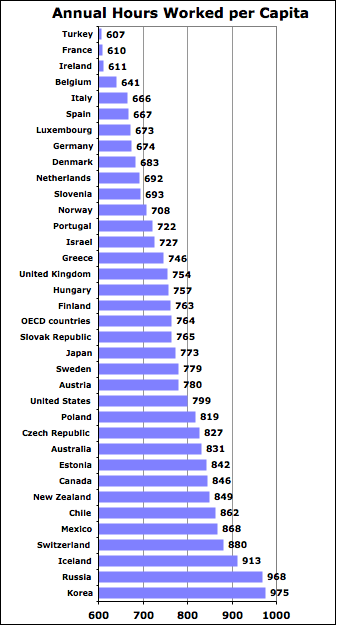 The OECD has posted this measure for most countries for 2013, so I thought I’d update this chart. It pretty much speaks for itself. Pricing is the ultimate miracle of Darwinian markets. Competitors who produce goods at lower prices thrive, expand their operations, and produce more. Those who charge higher prices (for equivalent goods) are driven to extinction when sensible purchasers abandon them for their more-efficient competitors. This inexorable mechanism drives innovation, investment, and productivity, and the eternal grinding evolutionary churn of “creative destruction.” Survival of the fittest makes us collectively fitter, and fills our wants and needs at ever-lower prices. All of that, or course, requires price competition among producers. The ultimate bogeyman, choking that mechanism, is competitors colluding to fix their prices. If they agree not to compete with lower prices — collectively stealing higher profits from their customers — the pricing mechanism doesn’t exist, and its manifest benefits are denied us. It’s a compelling and convincing story. But: The key word in that second paragraph is “agree.” It’s illegal, of course, for competing firms to explicitly collude to set higher prices. But price collusion occurs constantly at higher, institutional levels, where it is unstated, implicit…and profoundly pernicious. Randall Morck, the academic, finds that in large parts of the world pyramidal business groups allow “mere handfuls of wealthy families” to control entire economies. With all competitors controlled, ultimately, by a handful of actors, price collusion seems inevitable. This problem is particularly marked in developing countries, but is also common in much of the rich world, except in the Anglo-Saxon sphere. United’s top five shareholders—all institutional investors—own 49.5 percent of the firm. Most of United’s largest shareholders also are the largest shareholders of Southwest, Delta, and other airlines. The authors show that airline prices are 3 percent to 11 percent higher than they would be if common ownership did not exist. That is money that goes from the pockets of consumers to the pockets of investors. We’ve all watched this airline-pricing scenario play out over recent months, with fuel costs plummeting while airfares remain unchanged. The investment management company BlackRock is the top shareholder of the three largest banks in the United States; BlackRock is also the largest shareholder of Apple and Microsoft. The companies that are the top five shareholders of CVS are also the top five shareholders of Walgreens. (And yes, one of them is BlackRock.) Institutional investors dominate the economy. How exactly might this work? It may be that managers of institutional investors put pressure on the managers of the companies that they own, demanding that they don’t try to undercut the prices of their competitors. If a mutual fund owns shares of United and Delta, and United and Delta are the only competitors on certain routes, then the mutual fund benefits if United and Delta refrain from price competition. The managers of United and Delta have no reason to resist such demands, as they, too, as shareholders of their own companies, benefit from the higher profits from price-squeezed passengers. Indeed, it is possible that managers of corporations don’t need to be told explicitly to overcharge passengers because they already know that it’s in their bosses’ interest, and hence their own. Institutional investors can also get the outcomes they want by structuring the compensation of managers in subtle ways. For example, they can reward managers based on the stock price of their own firms—rather than benchmarking pay against how well they perform compared with industry rivals—which discourages managers from competing with the rivals. In America, you don’t find the explicit, extreme, and obvious family-pyramid control that’s so apparent in some other parts of the world. Control and ownership is more widely distributed across perhaps a hundred or a thousand families at the top. (Before you object: it depends on how you define “family” and “the top.”) How could price collusion happen among this larger group, with the inevitable incentives for some to defect with lower prices and take market share from the others? Simple: America’s richest families have farmed out their collusion to institutional entities who control markets (and market pricing), with small groups of institutions controlling all the players in each industry. In Posner and Weyl’s telling locution, “Competition among mutual funds cannot substitute for competition among corporations.” Ditto if you replace “mutual funds” with “private equity firms.” And likewise: competition among limited-liability corporations (Can’t pay off that loan? The people walk away scot-free) is based on incentive structures that are utterly orthogonal to those of independent butchers and bakers. The agents operating those institutions know quite clearly which side their personal bread is buttered on. The families who ultimately own everything, meanwhile, are many stages removed from, largely unconscious of, any particular pricing decisions. But they can be confident that those decisions are being made in their families’ best interests. The directors of such companies, however, being the managers rather of other people’s money than of their own, it cannot well be expected, that they should watch over it with the same anxious vigilance with which the partners in a private copartnery frequently watch over their own…. Negligence and profusion, therefore, must always prevail, more or less, in the management of the affairs of such a company. But he didn’t perceive these institutions’ potential for price collusion. America’s founders, on the other hand, displayed and expressed a far deeper distrust of limited-liability, joint-stock companies. Charters for such companies were uncommon and extremely restricted in their scope (building a particular public work, for instance) well into the 19th century. “Any legitimate business purpose” is a very recent innovation. Proponents of free markets seem unaware that that “peculiar institution” — corporations owning corporations — is in fact very peculiar indeed. It is arguably the most destructive innovation ever to strike at the miraculous wonder of the free market’s pricing mechanism. Anti-Competitive Effects of Common Ownership. April 15, 2015. José Azar, Martin C. Schmalz, and Isabel Tecu. Concentrated Corporate Ownership. 2000. Randall K. Morck, ed. Competitive Effects of Partial Ownership: Financial Interest and Corporate Control. 2000. Daniel P. O’Brien and Steven C. Salop. Do Publicly Traded Corporations Act in the Public Interest? March 1990. Roger H. Gordon. Financial transaction costs and industrial performance. April, 1984. Julio J. Rotemberg. 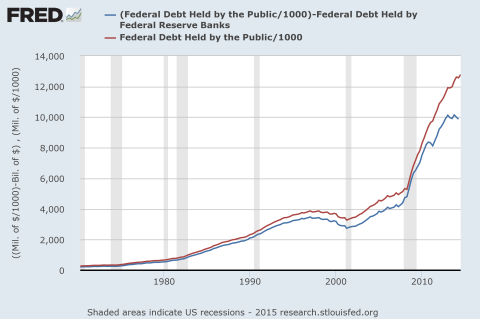 National Debt: Since When is the Fed “The Public”? This issue has been driving me crazy for a while, and I never see it written about. Federal Reserve banks are counted as part of “the public.” So government bonds held by this government entity — money that the government owes to itself — are counted as part of the debt government owes to others. 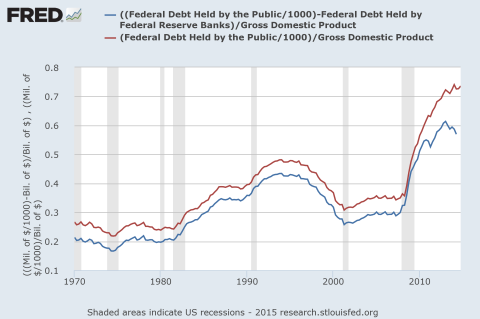 Debt actually held by “the public” equals 57% of GDP — and declining — not 73% of GDP. I don’t know how economists or pundits think they can have any conversation at all about this subject, analyze it in any useful way, if they ignore this basic reality. Reinhart and Rogoff, are you listening? 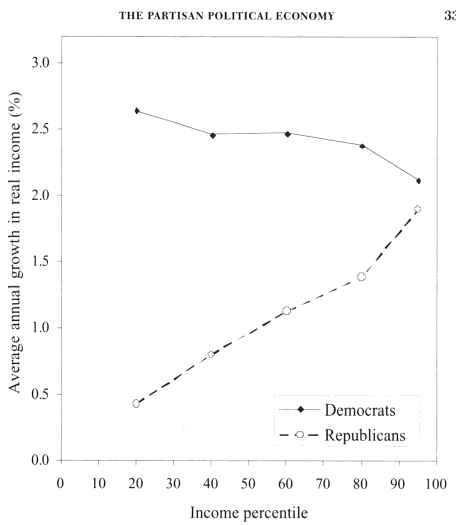 But now ask yourself: how many Americans know that Democrats make them richer? (Lots richer.) One in ten? Maybe? Now ask yourself why liberals keep losing. 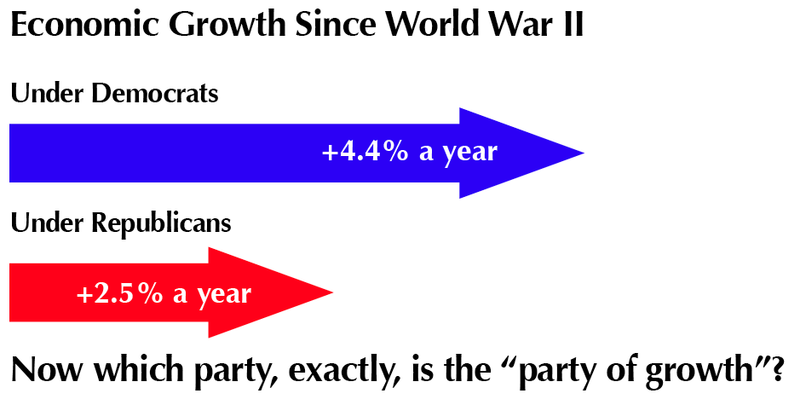 The Republicans have successfully branded themselves as “the party of growth,” and Democrats have just let them do it, for decades — even though it’s completely contrary to reality. Democrats have the strongest possible political argument sitting in their rhetorical holsters, but for whatever reasons, they just won’t draw. There is one and only one story that Democrats need to be telling, and they need to follow the Republican political playbook: repeat it endlessly, for years on end. We will make you richer. We’ve been doing it for decades, and we’ll keep doing it. “Equality” is important (especially because it does make people richer). But really: Americans just change the channel. “Opportunity” is important. But it’s just a proxy for, a chance of, getting richer. “Getting the rich” (truly progressive taxes, a more-level playing field, reining in finance) is necessary and important. But Americans get only visceral satisfaction from that message — it doesn’t speak to personal, direct, material benefit that they’re going to experience. Americans want to hear how Democrats are going to make them more prosperous. Full stop. And Democrats have a loud-and-clear story on that subject. They just need to 1) tell that story constantly, repetitively, ad nauseum, like the Republicans do, and 2) put aside other stories (like, identity politics) that dilute, confuse, and distract from that story. Start with that lede — “we make America prosperous” — and a whole litany of talking points emerges. And they’re the very talking points that have driven Republicans’ (otherwise inexplicable) political success over the last thirty years. But there’s one key advantage for Democrats: In their mouths…the story is true. Wisdom of the Crowds. Democrats’ widespread government spending — education, health care, infrastructure, social support — puts money (hence power) in the hands of individuals, instead of delivering concentrated streams to big entities like defense and business. Those individuals’ free choices on where to spend the money allocate resources where they’re needed — to truly productive industries that deliver goods people actually want. Preventing Government “Capture.” Money that goes to millions of individuals is much less subject to “capture” by powerful players, so it is much less likely to be used to then “capture” government via political donations, sweetheart deals, and crony capitalism. Labor Market Flexibility. When people feel confident that they and their families won’t end up on the streets — they know that their children will have health care, a good education, and a decent safety net if the worst happens — they feel free to move to a different job that better fits their talents — better allocating labor resources. “Labor market flexibility” often suggests the freedom (of employers) to hire and fire, but the freedom of hundreds of millions of employees is far more profound, economically. Freedom to Innovate. Individuals who are standing on that social springboard that Democratic policies provide — who have that platform beneath them — can do more than just shift jobs. They have the freedom to strike out on their own and develop innovative, entrepreneurial ventures that drive long-term growth and prosperity (and personal freedom and satisfaction) — without worrying that their children will suffer if the risk goes wrong. Give ten, twenty, or thirty million more Americans a place to stand, and they’ll move the world. Profitable Investments in Long-Term Growth. From education to infrastructure to scientific research, Democratic priorities deliver money to projects that the free market doesn’t support on its own, and that have been demonstrated to pay off many times over in widespread public prosperity. Power to the Producers. The dispersal of income and wealth under Democratic policies provides the widespread demand (read: sales) that producers need to succeed, to expand, and to take risks on innovative new endeavors. Rather than assuming that government knows best and giving money directly to businesses, Democratic policies trust the markets to direct that money to the most productive producers. Labor and Trade Efficiencies. The social support programs that Democrats champion — if they truly provide an adequate level of support — give policy makers much more freedom to put in place what are otherwise draconian, but efficient, trade and labor policies. If everyone is guaranteed a decent wage by an excellent program like the Earned Income Tax Credit, we have less need for the admittedly mixed blessings of unions and protectionism. Take the graph from the top of this post and put it on billboards all over America. It’s time for Americans to understand who makes them richer. Is GDP Wildly Underestimating GDP? The markets have been showing a rather particular schizophrenia over the last dozen or so years — but not, perhaps, the one you may be thinking of. This schizo-disconnect is between the goods markets and the asset markets, and their valuations of U.S. production. A huge gap has emerged between what we’ve saved and what we’re worth. Household Net Worth is the asset markets’ best estimate of what all our privately-held real assets are worth. It’s our best or perhaps only proxy for that value. (Household net worth includes all firms’ net worth, since households are firms’ ultimate shareholders. 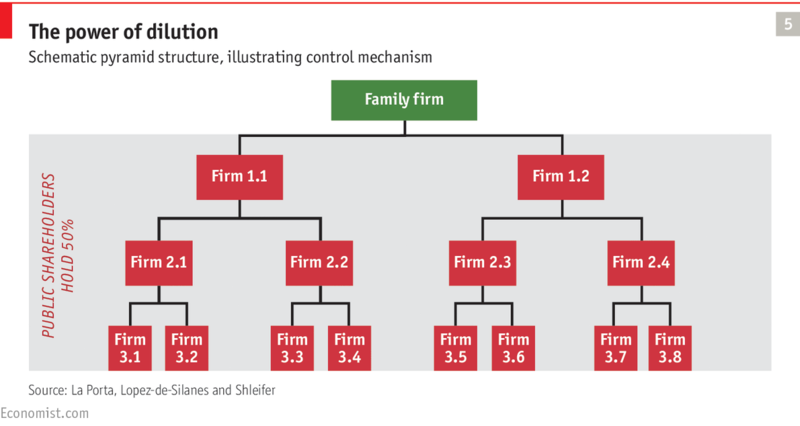 Firms, by contrast, don’t own households. Yet.) This is not just about assets like drill presses and buildings, but also skills, techniques, knowledge, organizational systems, etc. — all the tangible and intangible stuff that allows us to produce more stuff in the future. Household Net Worth at least provides us with an index of the change in that total value, as estimated by the asset markets. 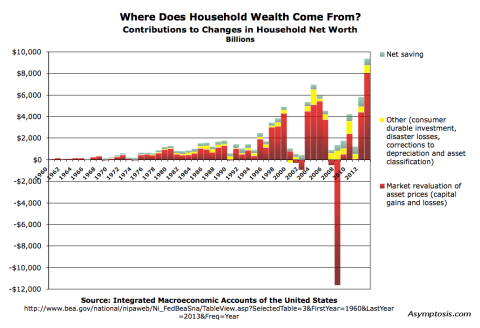 As we increase our stock of real assets (“save,” by producing more than we consume), household net worth (wealth, or claims on those real assets) increases. The valuation jumps up and down as asset markets re-evaluate what all those real assets are worth — how much output and income they’ll produce in the future — but the two measures generally (should) move together. Except: Since about ’98, and especially since ’02, that hasn’t been true. And no: zooming in on earlier periods doesn’t reveal the kind of anomaly we’ve seen since 2002. First, the flattening of cumulative savings: this measure was increasing exponentially for decades. Then it slowed significantly starting in the late 90s, and has gone flat to negative since The Great Whatever. 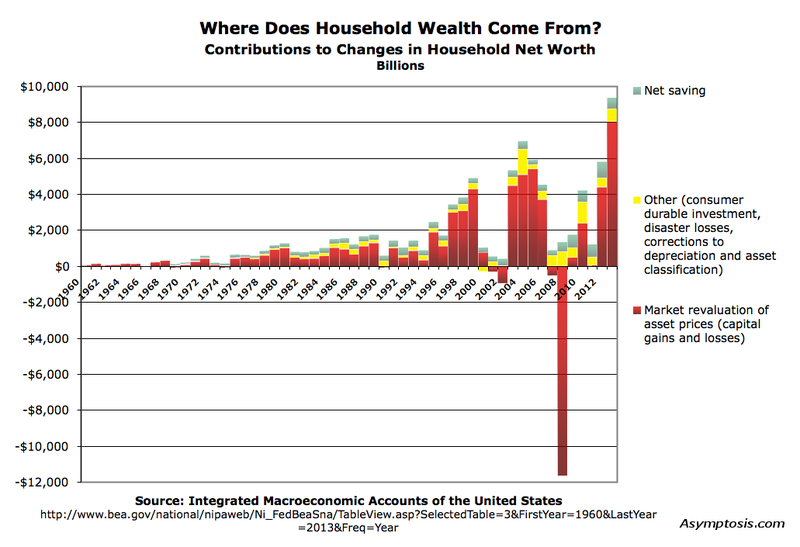 Second, the continued exponential growth of household net worth, and the resulting divergence of the two measures. 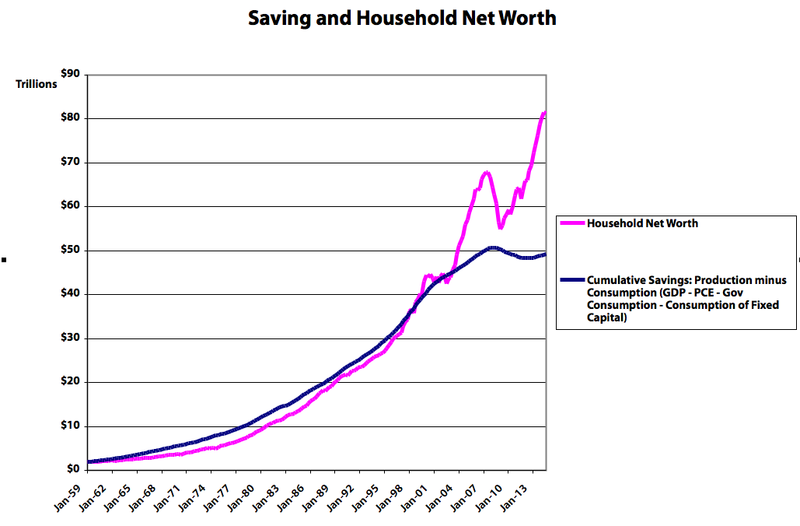 But bottom line: Net Worth and the cumulative stock of savings used to move pretty much together. They don’t anymore. What in the heck is going on? The goods markets are wrong. The market for newly-produced goods and services is setting the prices for newly produced goods below the production’s actual value. GDP is wrong. We’re producing something that’s not being measured by the BEA methods (tallying up what people spend on produced goods). There’s production the GDP methods can’t see in sales, so it doesn’t show up in saving (production minus consumption). But the asset markets can see it (or…sense it), and they deliver it to households in later periods, through the mechanism of market asset revaluation/capital gains. Techno-optimists will like this last one. You’ve heard it before: The BEA has no sales-based method for estimating the produced value of free digital goods like Wikipedia, or the utility people derive from using them. They’re not purchased, so the BEA can’t “see” them. They could look at ad dollars spent on Facebook as a proxy for the value of browsing Facebook, but…that’s a pretty shaky estimation method, especially when many of those ad dollars would have been spent anyway, in other media. GDP simply doesn’t, can’t, measure that value, because nobody purchases it. The timing sure supports this invisible-digital-goods story. The divergence takes off four to eight years after the release of the first mainstream web browser, and the global mainstreaming of the internet in general. How does the internet/digital-goods story explain the flatlining of cumulative savings? Shouldn’t that continue to rise, though perhaps not as fast as net worth? Has the internet killed off sales (and accumulation) of traditionally measurable, purchased, goods to the extraordinary extent we see over the last dozen-plus years? Are the asset markets seeing something else that GDP can’t see? Improved supply-chain management? More-efficient corporate extraction of profits from other other (less-developed?) countries? 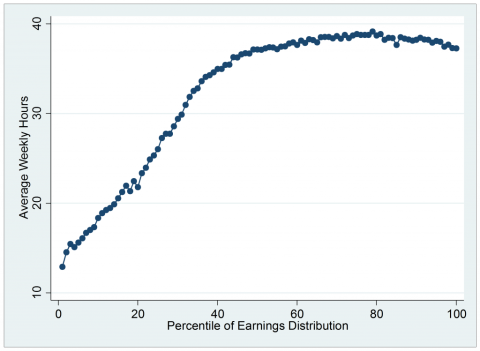 More-effective suppression of low-end wages? The rising costs of education and health care? (Which the BEA counts as consumption, extracted from saving, even though they’re arguably investment at least in part; they produce very real though intangible and difficult-to-measure long-term value/assets.) Or — here’s a flier — does it have something to do with the Commodities Futures Modernization Act and other financial “liberalizations” passed in the waning days of the Clinton administration? Something else entirely? In particular: would any of these explain the striking trend change in the cumulative savings measure? Whatever the causes, the divergence of these two measures suggests a rather profound and singular economic shift of late — a shift that is not being widely discussed, even amidst the recent spate of commentary on Piketty’s Capital. (Piketty, by the way, defines wealth and capital synonymously — though his usages are not always consistent.) Prominent exceptions include the economists Joseph Stiglitz and Branko Milanovic, who are actively interrogating the troublesome theoretical intersection of wealth and real capital. The recent divergence of these two national accounting measures suggests that they’re tilling fertile ground for our understanding of how monetary economies work, and how we measure those workings. Note: Technically one might add (negative) government net worth to the household measure to arrive at national net worth. 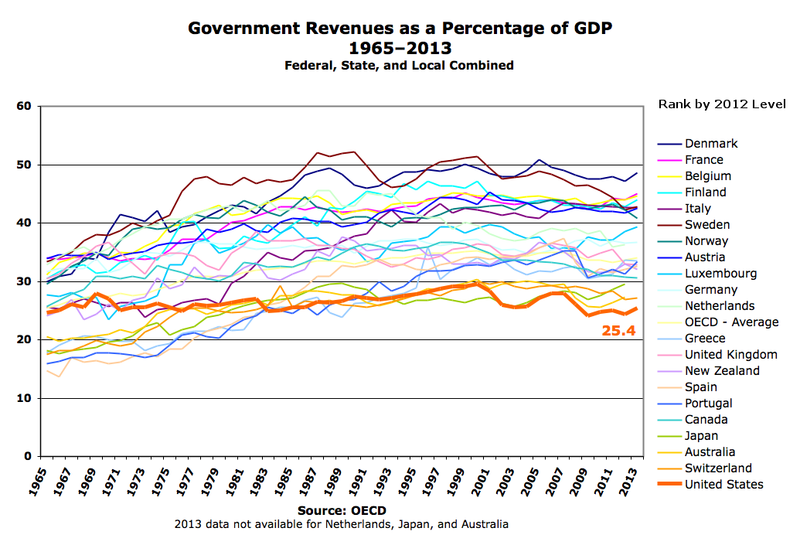 But: 1. government net-worth estimates are inevitably dicey to meaningless. Government assets (and services) aren’t generally sold in the marketplace, so we have no observable sales information to base our estimates on. Liabilities are also very tricky: estimates vary massively based on your chosen time horizon and (necessarily) arbitrarily chosen discount and economic-growth rates. And 2. It barely changes the picture drawn above. 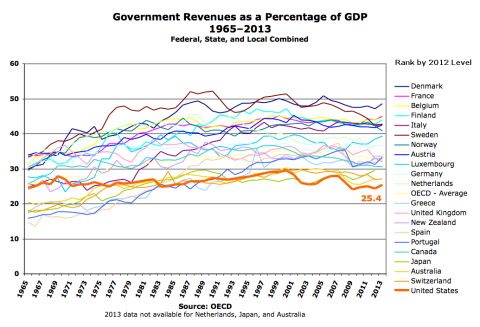 Feel free to add government to the spreadsheet if you want; you’ll find estimates of net worth for the federal, and state/local, government sectors here. Net worth is — as it should be — the bottom line for each sector. Why You Probably Don’t Understand the National Accounts. In Pictures. If anyone means to deliberate successfully about anything, there is one thing he must do at the outset: he must know what it is he is deliberating about. Otherwise he is bound to go utterly astray. Now, most people fail to realize that they don’t know what this or that really is. Consequently when they start discussing something, they dispense with any agreed definition, assuming that they know the thing. Then later on they naturally find, to their cost, that they agree neither with each other, or with themselves. That being so, you and I would do well to avoid what we charge against other people. A recent post of mine, How Do Households Build Wealth?, got a fair amount of attention (even a radio interview) because its takeaway graph seemed to surprise people (as it did me, when I put it together). Here it is again, presented more sensibly as a bar rather than an area chart. Click for larger. Note: the revaluations shown here are not “realized” capital gains (which really only matter for tax purposes). They’re changes in asset values. If your portfolio’s value goes up by $20,000 this year, that bumps your net worth by $20,000 even if you don’t sell any assets. Ditto your house, but without the second-by-second reporting of prices. How Much Was Your Ballot Worth in 2014? Amateur Socialist at Angry Bear asked me about how much was being spent per vote in 2014, and did the due diligence of finding me a spreadsheet showing how many ballots were cast per state. Ask and ye shall receive.